Hazard is defeated this issue, and though he's left alive, he won't appear again until an issue of X-Men Legacy, at which point he'll be killed off. 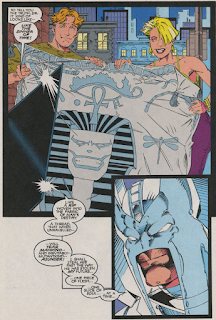 This issue devotes a couple of pages to "X-Cutioner's Song" (and the Cable limited series) setup, with Rusty & Skids retrieving a scroll for Stryfe with an image on it bearing a resemblance to Apocalypse. 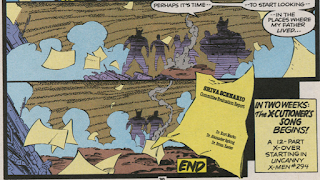 It's established here that Stryfe is acquiring artifacts related to Apocalypse (a plot thread the Cable series will pick up on), and also that Stryfe and Apocalypse have a history together (which will factor heavily into "X-Cutioner's Song", as well as future Apocalypse stories). 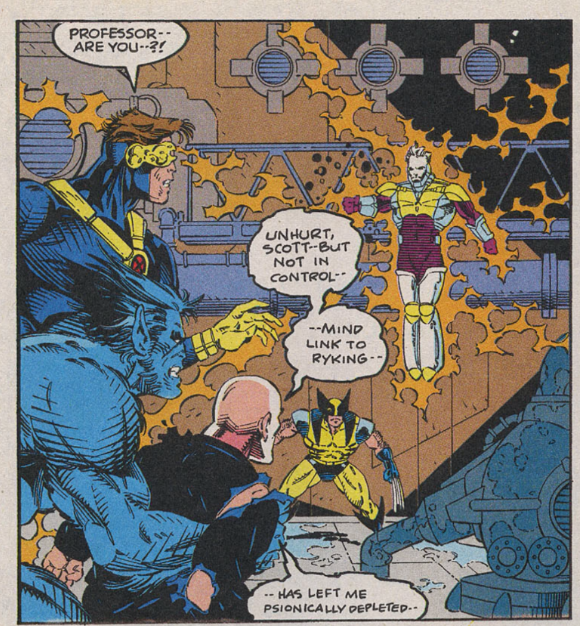 Further "X-Cutioner's Song" setup: Cannonball appears briefly, attempting to contact Xavier, or Storm, or Cyclops, but reaching only Jubilee, who ponders after he hangs up if she should have traced the call. The end of the issue further teases a connection between Xavier's father and Wolverine's past, listing the names of Xavier, Marko and Ryking on a memo pertaining to the Shiva Scenario (the program sending the killer Shiva robots after members of the Weapon X project over in Wolverine), but nothing much ever comes of this tease. 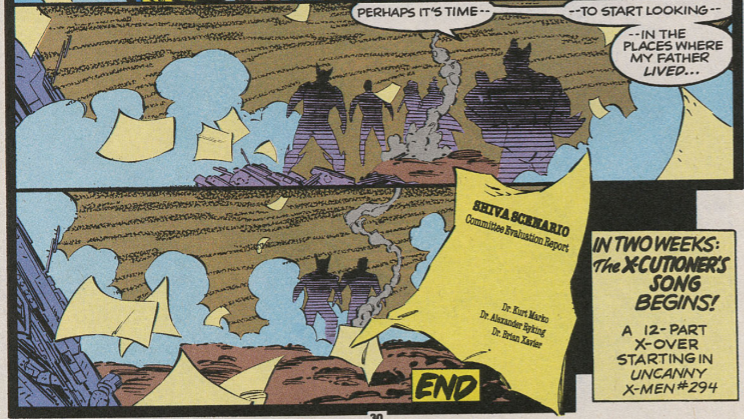 When the X-Men arrive to rescue Xavier, he says that he is psionically depleted, a convenient way to keep him from just ending the fight himself (but I appreciate Nicieza providing an explanation to that effect). 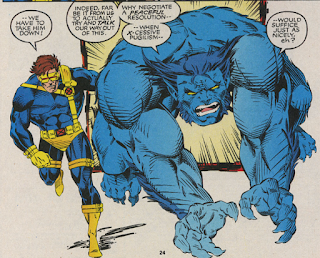 Beast snarkily asks why bother talking to Hazard when they can fight him, then later apologizes to Cyclops for bantering and promises to return his attention to the pointless fight. Wolverine mentions to Rogue his recent struggles with his animal side, saying he wants to tear through things instead of think them through, and that after spending so much time fighting to control the beast inside hi, he's starting to wonder if the man is the lie, one of the few times the whole "Wolverine is becoming more animalistic" idea setup by Larry Hama in Wolverine #50 gets referenced outside of that series. 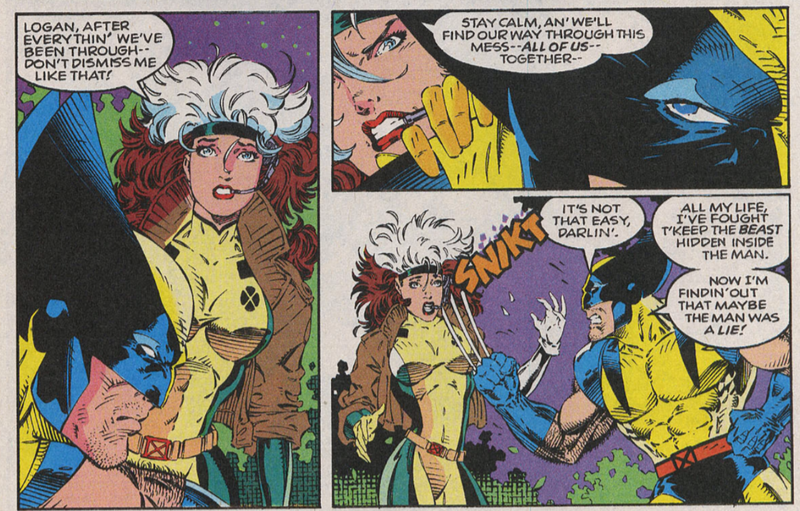 This scene also references Rogue & Wolverine's history together, something often overlooked despite the fact that they've been on the team together a long time (from roughly issue #171 to #247, and then the thirteen issues of this series). A response to a letter in this issue mentions that the larger an object is, the longer it takes for Gambit to charge it (which is partially why he uses playing cards), which is, I believe, the first time that particular ratio is established. The ho-hum two-part Hazard story concludes ho-humly, with Xavier rescued, Hazard defeated and the mysteries about Xavier's father mostly hand-waved away and/or swept under the rug in the process. Art Thibert continues his Jim Lee impression, but is also sloppy in some of the storytelling (everything in this story takes place in a secret basement, but all the stairways leading to it are drawn going up; Wolverine & Rogue are captives of Hazard on one page, but free, without comment, on the next). 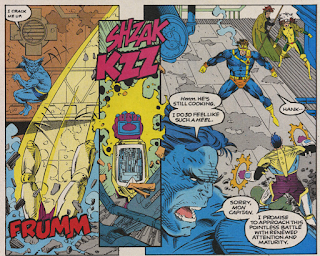 Hazard's powers are vague, so he's more or less as much of a threat as he needs to be until the issue runs out of pages, and then Cyclops shoots his gauntlets and it's over. The one potentially interesting bit is some commentary from Beast, chiding the pointlessness of the fight, which is perhaps Nicieza taking some digs at the conventions of the genre (or could just be 'witty' banter from Beast). Nothing here is terribly bad; it's all just terribly average, which, along with being wedged between Jim Lee's run and "X-Cutioner's Song", is why this whole thing is ultimately so forgettable. 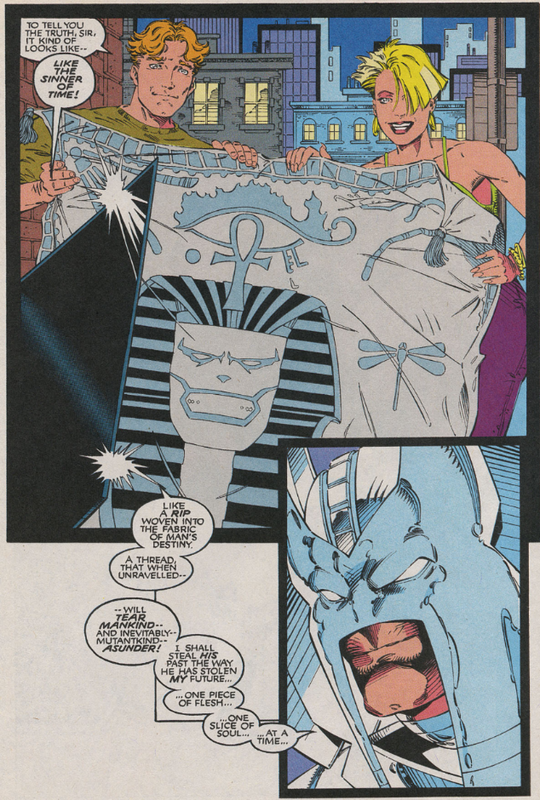 Tomorrow, Psylocke guest stars in Excalibur #55. Friday, Silver Fox shows up in Wolverine #62. Next week: Cap-Wolf! 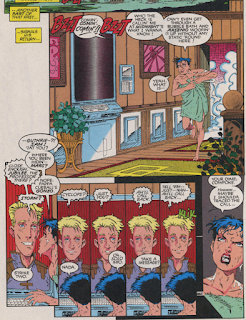 Although it's true that Art Thibert's blatant imitation of Jim Lee is annoying, but I have to praise him for having drawn Cannonball as the skinny, long faced your men he truly was (remember the early New Mutants issues? ), instead of the generic strong blond guy that became common with Liefeld and Capullo (to the point that I couldn't recognize him when Joe Madureira came along). I agree. Cannonball as a X-Man was very generic, specially with Joe Madureira and the Kubert brothes. Yeah, "MY" Cannonball will always be the skinny jug-earred buzzcut one. A while back I left a comment on an issue of New Mutants (Around #75) asking who the letterer of the story really was - The credits said Tom Orzechowski and the hand writing looked like his, but the word balloon outlines didn't. I guessed Richard Starkings. I realize now, though, that Tom and his wife Lois Buhalis would often work together on issues even if only one was credited. Lois is credited in this issue, but a bunch of the word balloons are clearly Tom's. So in that issue of NM it was more than likely Tom doing the text with Lois doing the balloon outlines. I'm curious to go back and check some more issues around this time to see how many of these assists there were. @Austin: Hazard actually next appears in X-Men #38 when Adam X goes to visit him in prison and Gambit #4 when he is shown being visited by Fontanelle in one of his dreams (both plots are build-ups to the Black Womb Project). Interesting that the folder shown at the end of the issue replaces the "Project Xavier" folder introduced earlier in #5 with one titled Shiva Scenario. So two plots are merged, but I’m sure that wasn’t Jim Lee’s original plan. I’m sure he had a different scenario in mind. 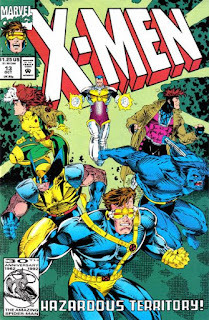 The splash/title page has some pretty dire foreshortening on Xavier and Hazard. As Licinio said, though, it’s nice to see Cannonball drawn as the lanky young man he was under McLeod, Sienkiewicz, Adams, etc., even if Thibert’s rendition goes a bit overboard in that direction. The backgrounds definitely get sparser as the issue progresses, which could mean pages were drawn in order and deadlines became a factor. I get that Hazard was in pain but after Xavier’s desperate attempt to help him for what seems like everyone’s safety it’s rather anticlimactic to leave Hazard merely drained and everyone else left standing (due to being in the “eye a’ d’ hurricane,” per Nicieza’s hand-wave via Gambit) amidst such awesome destruction. "Hazard is defeated this issue, and though he's left alive, he won't appear again until an issue of X-Men Legacy, at which point he'll be killed off." 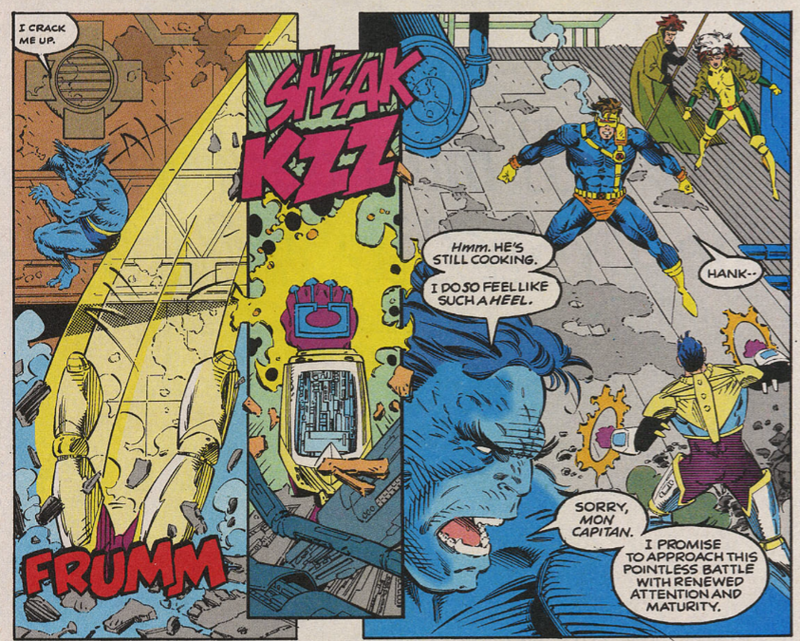 Hazard appears very briefly at an "Interlude" in X-Men (vol. 2) #38. He is arrested at this point and mentions "Mulbury" when Adam X visits him. Interesting that, after ditching the orange-and-brown suit in an issue of his solo series, WOlverine is finding the animalistic urges even stronger when dressed in the classic tropical fish outfit. My theory is that the orange-and-brown costume, serving as an external reminder of what he has to fight, helped hom consciously maintain and control his temper better. In additon, he had Mariko as an additional tempering influence, and his time in Japan exposed him to a rigid mental discipline he tried to adhere to. 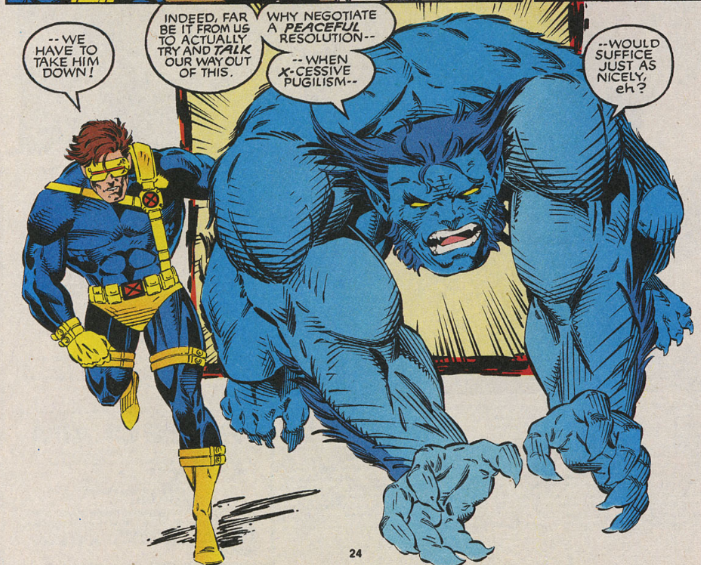 Once Logan went back to blue-and-yellow, it felt a lot like he stopped trying. It didn't hurt that his return to that costume was shortly followed up by probably the single greatest physical trauma the had suffered since the adamantium bonding, Magneto's UNbonding and forcibly ripping the adamantium from him in X-Men #25. I don't think we ever saw him really try to regain control over his inner animal again from then until after the Schism in the early 2010s.